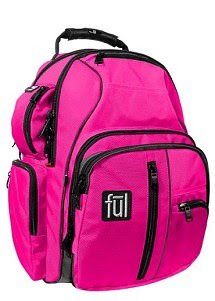 fūl is an active lifestyle brand specializing in bags and backpacks for people who refuse to sit on the sidelines. The company was founded with one goal in mind, "Create quality bags and apparel for individuals who believe in living life to the fullest." In order to do this, their parent company, JALP, LLC, gathered an edgy team of experts from all over the world - with over 100 years of combined experience, and a rare mixture of business sense and passion for life. Their "fūl® family"consists of extreme sports enthusiasts, graduates who have lugged books and laptops around campus, and fashion forwards. They've used these personal experiences to create bags which support people lifestyle by combining design, durability and functionality. Like barbeque, Elvis and the blues, fūl® was born in Memphis, Tennessee. And as they continue to grow and evolve, there is one thing that remains constant - fūl®'s commitment to providing their customers with the most unique and dependable bags out there.